Sir Frederick Ashton, actually born in Ecuador about one century ago, was Britain's most renowned choreographer. Ashton choreographed his first ballet at the age of 21 and later was Co-Founder of the Ballet Club, later Ballet Rambert. He served in the Royal Air Force and joined Ninette de Valois as associate at Vic-Wells Ballet, later The Royal Ballet, which he directed from 1963 to 1970. 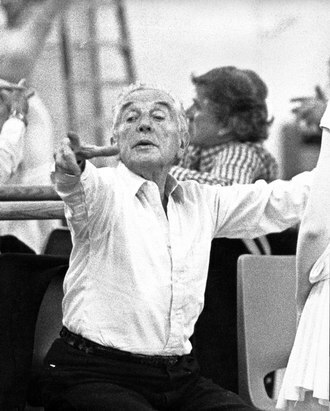 Ashton produced 80 ballets, opera dances, film dances, and musical comedies. He mentored dancers and choreographers and developed an enormous following in the international arts community. (Program Notes). The Royal Ballet (Scènes de ballet, 1991, London): Music by Igor Stravinsky, Choreography by Frederick Ashton, Design by André Beaurepaire, Lighting by John B. Read, Staging by Christopher Carr, Principal Coaching, Christopher Carr and Lesley Collier, Performed by Miyako Yoshida, Ivan Putrov, and the Company. As the first piece presented by the Royal Ballet in this Festival, Scènes de Ballet was relatively flat and uninteresting. Ivan Putrov exuded charisma in this somewhat surreal and classic patterned work, but the excitement I remembered of the Royal Ballet in town seemed to elude this opening event. Stravinsky's scores can be enormously enhanced and expanded through the genre of dance. Yet, this work with interlocking and repetitive patterns, multiple spins, and a hint of Cocteau (André Beaurepaire, Designer, was a Godson of Cocteau), seemed to lack a connection with the audience. Miyako Yoshida was technically proficient and poised, but appeared emotionally distant and un-scintillating. The set, like a castle with large keyhole windows, and the costumes, white on black, with black hats and men in purple tights, both added to the historical placement of Stravinsky and Ashton, but without their collaborative charisma. The Sleeping Beauty - Awakening Pas de Deux - Act II: Music by Peter Ilyitch Tchaikovsky, Choreography by Frederick Ashton, Costume Design by Lila de Nobili, Performed by Darcy Bussell and Roberto Bolle. The Divertissements, all Pas de Deux, unlike the previous work, exuded charisma and emotional energy. The Sleeping Beauty Awakening scene, with the renowned Darcy Bussell as Aurora, was as exquisite as lemon drops from heaven. Both Roberto Bolle and Ms. Bussell engaged the audience in their striking sense of affect, of ethereal romance. This pas de deux alone was worth the evening. Ms. Bussell's pointe work was sensational. The 100 years of sleep were erased in a moment of bliss. Ondine Pas de Deux - Act III: Music by Hans Werner Henze, Choreography by Frederick Ashton, Costume Design by Lila de Nobili, Performed by Tamara Rojo and Iñaki Urlezaga. If Sleeping Beauty Pas de Deux was worth the evening, Ondine Pas de Deux would be worth a season of Royal Ballet performances. Ms. Rojo and Mr. Urlezaga re-created the fatal kiss that fells the knight Palemon. Lila de Nobili's costumes allowed for the sexuality that roars rampant in this final dance of Ashton's three-act ballet. Ms. Rojo mesmerized and magnetized Mr. Urlezaga with classical but personalized gestures that tempted me to find a video of this rare ballet. Thaïs Pas de Deux: Music by Jules Massenet, Choreography by Frederick Ashton, Costume Design by Anthony Dowell, Performed by Leanne Benjamin and Thiago Soares. In orange and gold costumes designed by Sir Anthony Dowell, a solemn dance en pointe, with rapid, backward steps and tantalizing theatricality, this rapturous pas de deux, set to Massenet's exotic score, Ms. Benjamin and Mr. Soares united soulfully and sensually to maintain the choreographic fireworks of the chosen Ashton Divertissements. Die Fledermaus - Voices of Spring Pas de Deux: Music by Johann Strauss II, Choreography by Frederick Ashton, Costume Design by Julia Trevelyan-Oman, Performed by Alina Cojocaru and Johan Kobborg. Just when I thought Thaïs could not be upstaged, Die Fledermaus showcased the virtuosic duo, Ms. Cojocaru and Mr. Kobborg. With an upbeat and inspired score by Strauss, the vision of springtime was more than expected. With Mr. Kobborg carrying and uplifting Ms. Cojocaru across the stage in elegant form, with athleticism and aerodynamic speed, Die Fledermaus Pas de Deux was a strong closing piece for the well-chosen Divertissements. The costumes, in white and green, with patterned leaves on Mr. Kobborg's shirt and a flower garland in Ms. Cojocaru's hair, were well conceived by Ms. Trevelyan-Oman. The Royal Ballet (Marguerite and Armand): Music by Franz Liszt, Transcription for Orchestra by Dudley Simpson, Choreography by Frederick Ashton, design by Cecil Beaton, Lighting by John B. Read, Performed by Sylvie Guillem as Marguerite, Massimo Murru as Armand, Anthony Dowell as His Father, Christopher Saunders as A Duke, the Company as Admirers of Marguerite, Gemma Sykes as Maid, Piano: Philip Gammom. If I had seen this work before, it was with the legendary duo, Margot Fonteyn and Rudolf Nureyev, dancing with this same Company. I do have their renowned performance on video, and their onstage/offstage romance was well documented. Tonight's performance with Ms. Guillem as Marguerite, whom I had seen onstage in this theatre and in Paris with Paris Opera Ballet, and with Mr. Murru as Armand, was powerful and persuasive, with psychic momentum. However, Ms. Guillem, as Lady of the Camellias, dying of consumption, seemed internalized and self-absorbed, probably intentionally, as she interpreted this impassioned story of conflicted love. With Cecil Beaton's ethereal set, long white curtains hung around the daunting deathbed, and the other interiors and corners for Sir Anthony Dowell (dancer and former Director of Royal Ballet), as another internalized character, Armand's father, Marguerite and Armand exuded passion and pathos. I had not seen Mr. Dowell onstage in many, many years, and I recall his classiness and presence. Neither quality has diminished, and Mr. Dowell's "minor" role developed into major stage presence. Ms. Guillem and Mr. Murru re-enacted, in between stage darkness, five different scenes in various sets and moods. The first and finals scenes, with impending and certain death by consumption, seemed more compelling than the scenes between. The chemistry between Ms. Guillem and Mr. Murru could never rival that of Ms. Fonteyn and Mr. Nureyev, and, in spite of the wondrous score of Franz Liszt with Philip Gammon's bravura piano solos that perfectly matched the ongoing choreography and drama, I longed for an earlier, onstage connection. Mr. Murru, Italian, and Ms. Guillem, French, were most effective when Armand ran to Marguerite's deathbed in windblown cape, took her in his arms, lifted and swept her in wild abandon, and kissed her till she died. Now, this was ballet, as we want it. Kudos to Lincoln Center Festival 2004.